Several days of torrential rains, unusual for San Diego, broke on Christmas Eve. Mid-morning, my wife and I took advantage of the brisk, but dry, weather to walk to Trader Joe’s. 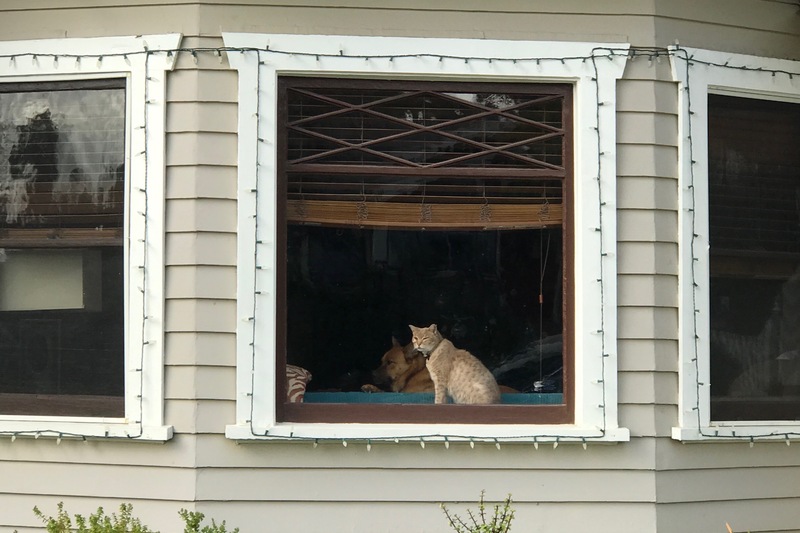 Down Maryland Ave., a block or two from Monroe, Anne spotted a cat in a house’s front window—with a dog! Using iPhone 7 Plus, I shot six or so photos before the feline finally looked out (the woof-woof had his attention turned inside). The Featured Image is a 100-percent crop. Vitals: f/2.8, ISO 20 1/244 sec, 6.6mm. Also in this series: Scruffy, Roly Poly, Woo, Skull, Biscuit, The Colonel, White, Chipper, Frisky, Stretch, Needy, Farfisa, Mates, Hunter, Pee-Pee, Blue, Blue Too, Bonded Pair, Patience, Fess, Jumper, Frenemy, Looker, Cozy, Scout, Lurks, Skit, Mini, Betty, Black and White, Stalker, Bell, Chill, Sammy, Scratch, Poser, Star and Grey and White.